Oh thank heavens I can still hope for the Fall Marburger show! Looks just lovely.. And, I bet Marburger is just enchanting! One day perhaps I'll get there!!!!! Very interesting. I'm headed over now to check out the Marie Antionette bottles. Sorry you can't go :(...hope you make it next time around...I know how you love it! 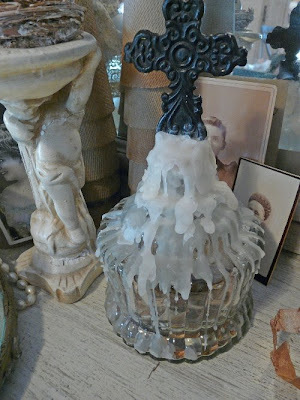 I have never tried dripping wax...Tracie has certainly made an art form out of it hasn't she? I think your bottle turned out so cute! Whatever, whoever, or wherever "Marburger" is I'm sure it, he or she is fabulous, LOL! I love Tracie's bottles, too! She's very gifted and lucky you! Your secret is safe with me! LOL! I used to do that with old bottles. Loving it...m.
I can't make it this spring either..it would be painfull. The weather has been crazy here in Texas, by fall it should be splendid. Thats what I keep telling myself as I see the calander days counting down to Marburger. I still have never been, and now I am within driving distance!